Shelly Saunders, Kevin Cronin, Glen Denning and Julian Nevares. This information is subject to change. Please check with the pool at the time of your visit to receive the most up to date information. Yorktown’s new pool has been in service since January 15, 2012. The pool is located on the Yorktown Boulevard side of Yorktown High School, and offers amble parking accessible from Greenbrier St. Please enter the pool at DOOR NUMBER 3. 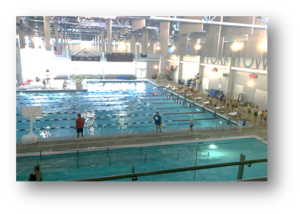 The facility offers an 8-lane x 25 yards competition pool with a fully decoupled diving well, and a separate instructional pool. The competition pool is 4 feet deep at the shallow end, sloping to a at least 6.5 feet on the starting end. It contains swim outs at the deep and shallow end is equipped with the standard over the wall ladders at the deep end. The water is kept at 81-83 degrees. The diving area, completely separated from the lap lanes, offers two 1-meter springboards. The pool is equipped with Colorado Timing and Scoreboard. There is also a separate instructional pool with a ramp entry and steps on one side and 4-foot depth on the opposite side. This pool is kept at 83-85 degrees. A wet classroom, available for pool party rentals, and a spectator area with capacity in excess of 200 spectators overlooking the pools are also available. The facility also offers full locker rooms with individual showers as well as four separate and fully equipped family changing rooms, two of which are fully accessible.